Well, it's official, according to Gus Hansen, "It's been a great summer." And we couldn't agree more. The 2018 World Series of Poker finished weeks ago, yet Hansen finally left the high stakes game of Vegas to venture back to Europe for a "change of pace," according to his latest Instagram post. Hansen appears to be at the airport as he shares his final video from Sin City, where he reveals that he logged a total of 652 hours across a 70-day period playing the nosebleeds inside Bobby's Room at the Bellagio. That comes out to about 9.5 hours of poker each day on average, which doesn't seem that grueling but we all know there must have been a few marathon sessions sprinkled across that time. Hansen leaves off with, "I'm a sick, sick man." Yes, you are Gus and we are all better for it. Here's a look back at some of his greatest Instagram posts from this supposed "great summer" that we are all blessed and fortunate to witness. According to his timeline, Hansen arrived in Las Vegas on May 28 and provided some of the best content from a poker pro anyone could ask for. Hansen was not only entertaining and showed glimpses of life off the felt, but he also did something that most pros don't, gave us the inside scoop into one of poker's most exclusive card rooms. He shared both video and photos of some of the biggest high-stakes games in Vegas and probably the world. There were appearances by Jason Mercier, Daniel Negreanu, Phil Galfond, but perhaps everyone's favorite guest star was Daniel "Jungleman" Cates. I mean, once you provide gems like these, it's hard to want to see anyone else. It wasn't all about poker though, for Gus. The Vegas nightlife is alluring, after all. Although Hansen kept things mostly centered around the high stakes games, he did sprinkle in a few radicals to keep things interesting. And interesting they were. I mean, this is just his daily life, right? And let's not forget to throw in a little gamble, gamble. And somehow, at some point, he lost his shirt? But maybe that's part of the whole Bobby's Room experience. 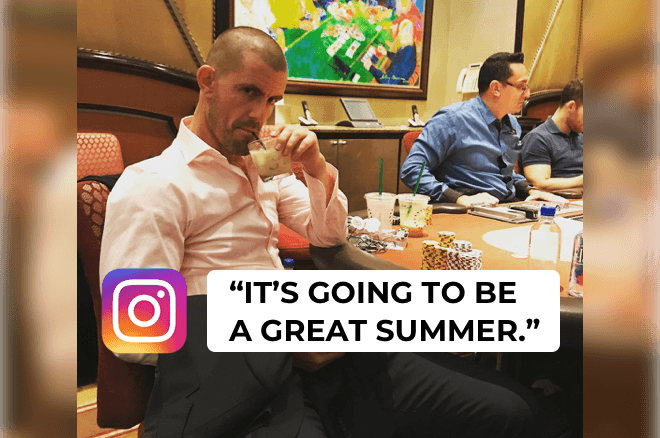 In any case, it certainly was a great summer not only for Gus but for all of us who got to witness some of the craziness that comes with being a big name, high stakes player, grinding out the hours in one of the world's most prominent poker rooms. Thank you Gus, we all appreciate the entertainment.